It’s asking for trouble, isn’t it, using superlatives? Some smart-alec is bound to pop up and contradict your claim. Quite right too. But it’s an eye-catching headline and we really shouldn’t allow truth to get in the way of a good story. Your comrade will be so overwhelmed that they may even treat you to a glass of something in the Clarence across the road on Whitehall, on the corner with Great Scotland Yard. Actually, I lied; it’s not really a police station. 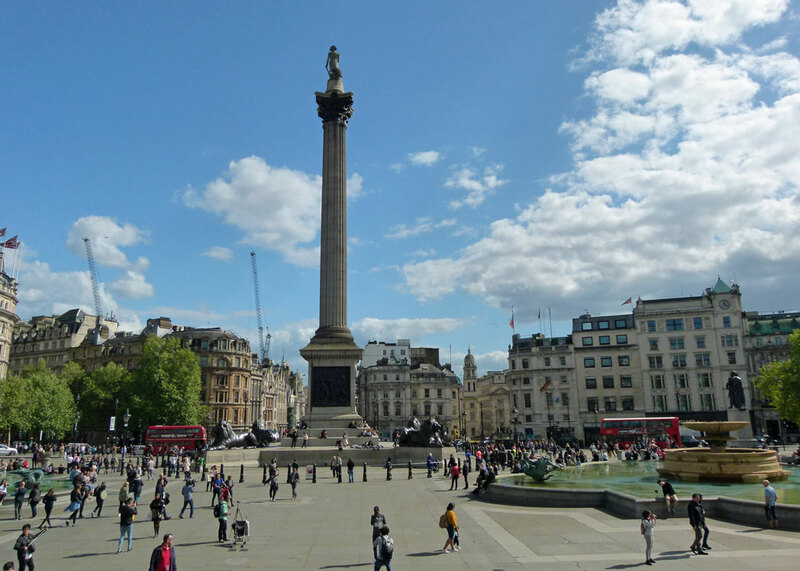 Trafalgar Square has long been a focal point for public gatherings and, it must be said, a smidgen of rowdiness – with the occasional riot thrown in for good measure. 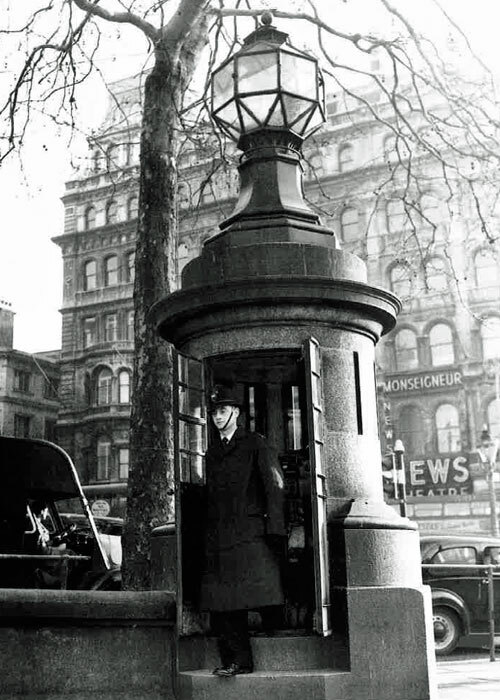 This small structure was in fact a kind of police observation post, created in the late 1920s by hollowing out the plinth that housed a gas lamp, dating from 1826. Slits were ingeniously cut in the side to provide 360 degree vision and a direct telephone line connected it to Scotland Yard, headquarters of the Metropolitan Police. Apparently, it is large enough to hold one policeman or two prisoners (London’s criminals are quite small). Once electricity was installed, the light flashed blue when the receiver was lifted (or when the telephone rang – it depends which account you believe) in order to alert other constables to the possibility that something was amiss. Whistles blew, truncheons were waived and men came running to assist, practising puffing out, “You’re nicked, mate,” as they went. Legend has it that the lamp originated from Nelson’s flagship, HMS Victory; alas, this is unlikely. Alas, also, the tiny ‘police station’ in Trafalgar Square is no longer in use. I am not sure when it was decommissioned. It is mentioned in a London guide published in 1979 (a photo shows it with dirty, cream, doors), and it seems to have been working then. No doubt it gave way to cheaper CCTV. Or maybe they couldn’t connect a PC to it… The Met is helping us with enquiries on this and you will be the first to know what they say – though, obviously, they are quite busy catching bad people, so don’t hold your breath. These days, the world’s smallest police station is apparently used as a broom cupboard by Westminster City Council. Seems like it’s made a clean break with its past. This article first appeared in an earlier version of A Bit About Britain in 2016. Since then, more information has appeared on the Internet, not least an in-depth article on the excellent IanVisits blog, backed up by first-class research. Just curious – why is it unlikely that the light came from the HMS Victory? … hee hee … I saw this on my last visit to London – but I didn’t know what it was. I was paying more attention to the (apparently impromptu) concert being played in Trafalgar. Ok, I read the other blogger’s post as well, and although a lot of info, I must say you’ve got him beat in the interest and humor departments, by a long shot!! And the most pressing question i now have is why Brits have brain waves whereas Americans have brain storms. How cool is that! Had to laugh at your imagined dialogue too. I’ll try to spot this when I’m in London this week. Ha! I do love how you wrote this one up Mike. Dr. Who ? I am sure my boys would of thought of the Tardis. That’s what I was thinking of, too. I am picturing scores of policemen pouring out of it (because it’s bigger on the inside than on the out, like the Tardis). But it’s very cute. I must have walked past that several times and I didn’t notice it! Once you explained it was an observation post I understood it, we have small buildings here but not that small that are on the side of the main highways where the police can do breath testing etc. I’ll be there and I’ll check it out! Ministry of Magic/ Men in Black it certainly is calling out to be the entrance to extensive way underground premises. Subject to one way glass it could have been useful for female police officers to adjust their dress. Jolly spiffing indeed! 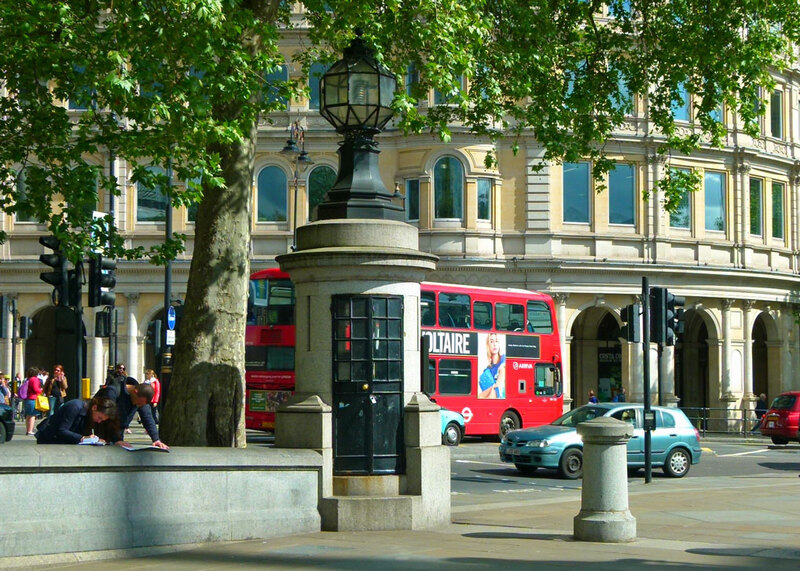 It has been so long since I’ve last visited London, and walked across Trafalgar Square – I am sure I have never noticed this. But if the question comes up at the next pub quiz, “Where is the world’s smallest police station”, I will know the answer! The early 19th century plinth that housed the gas lamp was actually designed very nicely. If I wasn’t a bit claustrophobic, I’d use it to sell coffee. I wonder if it has a water supply; I doubt it! Love the old photo with the bobby on duty. Silly twits should revive it as a cop shop for practical purposes like arresting errant pigeons and charming tourists. Arrest the pigeons by all means, but leave the tourists alone! I think the people who make Dr Who missed a trick. This is much better than a plain old Police Box (you could do an article explaining about police boxes for all those young folks who have no idea what the real function of the Tardis is). Haha, one policeman or two prisoners! I dunno, I imagine all London criminals to look a bit like Mundungus Fletcher from Harry Potter, and he’s really small, so that makes sense to me. Very interesting though, I never knew it was there! That was fun…and thank you for the link…stealing granite…whatever next! I must have walked past that loads of times and not even seen it, let alone wondered what it was. I’m glad to be enlightened, though.